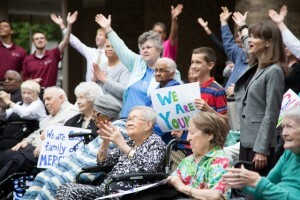 Rosary Mission, in collaboration with the Little Sisters of the Poor, has launched a new initiative called “Youth&Aged for Life” that unites young people with the elderly in fellowship, prayer and song for a culture of life. Our regular meetings in Washington include a moment of catechesis, updates on local pro-life initiatives, singing and praying the rosary together. Every meeting concludes with food and fellowship to help cultivate bonds of friendship between the youth and elderly. We will soon establish a template that could be adapted to serve families, parishes, schools and homes for the elderly across North America. We have begun introducing “Youth&Aged for Life” to other Little Sisters’ homes and to a local high school in Washington. Stay tuned for more! Anthony and Catherine have asked us to include in our rosary intentions their 6 year old daughter, Teresa, who has a tumor. It is deeply moving to see how, as they unite their sufferings with Jesus on the Cross, their anguished prayer for Teresa reaches out to embrace all suffering children and their parents. And the Lord is hearing their prayer. The tumor is shrinking. Let’s join our prayers with theirs during this Year of Faith for Teresa’s complete healing. And let’s increase our prayers for the cardinals in Rome as they begin their pre-conclave meetings today. Let’s picture them gathered with Mary as the apostles were gathered with her in the Upper Room. Let’s pray that, like Mary, they yield so completely to the Holy Spirit that they are filled beyond their hopes and dreams with a new joy, hope, faith, love, humility, zeal, courage, wisdom, discernment, and all the gifts of the Holy Spirit for the whole Church in these difficult times! Brothers and sisters, do you believe that our humble prayers as members of the Body of Christ can move mountains? Really big mountains? Be Creative! Be Brave! Give God Permission to Use You! We went back to DC today to share the Good News in the streets. At first it was really difficult. And no one wanted a rosary. The place felt cold and unfriendly. I wanted to run away. Then something amazing happened. As we approached a homeless man in Dupont Circle, my friend Brian said, “This guy will respond…., he is one of God’s little ones.” The man greeted us with a big, beautiful smile and welcomed us. “Of course I’ll take a rosary!” As we talked with him, I felt a heaviness lift as joy filled my heart. Then I noticed the song blasting from his CD player: “People Get Ready!” After that, everything turned around. People responded with warmth, and many were eager to receive rosaries. God has something incredibly beautiful for each one of us to contribute to the Year of Faith and the New Evangelization! He waits for our tiny “yes”, our humble efforts, and our few loaves and fishes. Then He moves in and does something fantastic and mysterious through us that blesses the whole world. So beautiful! Calling All Catholics to Collaborate with Conclave Cardinals through prayer and fasting! Call down “lightening bolts” of grace on the Vatican, the Cardinals and the entire Conclave! Don’t settle for spectator status. This is the Year of Faith! Jump in! Move those Mountains! Pray up a tsunami of grace to usher in a pope who will lead us into the New Evangelization to take the world by storm with love, love, love! I have a profound sense that the Lord, particularly through Pope Benedict’s request for prayers yesterday, is calling us to pray for the extraordinary events unfolding in Rome right now. The Lord is inviting us into the very heart of the action and I believe He wants us to know how profoundly our prayers will influence the results of the conclave and the decision of the cardinals. If we take this seriously I believe we will be amazed! The key, right now, is to pray for Pope Benedict and the next pope. Why not pray a novena for Pope Benedict until February 28th, and then pray several novenas for the next pope (including the cardinals and the conclave) until the white smoke rises from the Vatican? I just launched a blog for the New Evangelization in this Year of Faith: www.janisclarke.com My hope and prayer is that the stories will stir in people a hunger for intimacy with Jesus; for a deep, personal relationship with Him. I will also share stories on how to evangelize people we meet in our daily lives. I hope this blog will draw people to Rosary Mission and be a source of encouragement for those who are already part of it. The time is most certainly ripe for a world wide Rosary revival. Please share this new blog with friends and family members. And please pray the Rosary, and invite others to pray it with you! I am just back from England where I had my own “marathon” of sorts in the form of a mission! Highlights included: training youth for street evangelization and then actually doing it; inviting parishioners representing countries from around the world to pray, in their native tongue, for their country of origin, for England and for all nations; singing William Blake’s “Jerusalem”, for Brits in their native land; praying with people of many different nationalities for healing and peace; singing in parishes and meeting so many beautiful people; meeting the awesome Keralite community that is re-evangelizing England! We cannot forget that the Church exists in order to evangelize; to lead all people to Christ, the Savior of the world. And each one of us has a part to play in this great mission of mercy.